* Note: See the "Tempura Shrimp Hand Rolls", "Soy Syrup" and "Wasabi Oil" recipes which are included in this collection. Wash rice at least 3 times or until water is clear. Fill rice cooker with water to about 1-inch over rice. I highly recommend a rice cooker -- there's a reason more than 2 billion people in Asia use them. Slowly heat vinegar, mirin and sugar until very hot but not boiling. Fold in su (vinegar and sugar) with the hot rice, add enough so that the rice has a tart/sweet taste. Rice should be shiny, not mushy. Carefully clean inside rim of bowl with damp cloth, cover and let rest for 30 minutes. For the Herb Crab Salad: In a bowl, whisk together honey, mustard, lemon juice and oil. Add crab, herbs and minced shallot. Season with salt and pepper and check flavor. Lay nori, shiny-side down on sushi mat and lightly pat on rice on bottom half of nori, 1/4-inch thick. Place crab filling 2/3 up on rice. Roll, moisten end to seal and let rest. For plating: On a huge white platter, drizzle Soy Syrup, Wasabi Oil, sesame seeds, gari and scallions all over. Slice maki-sushi using both bias and straight cuts. 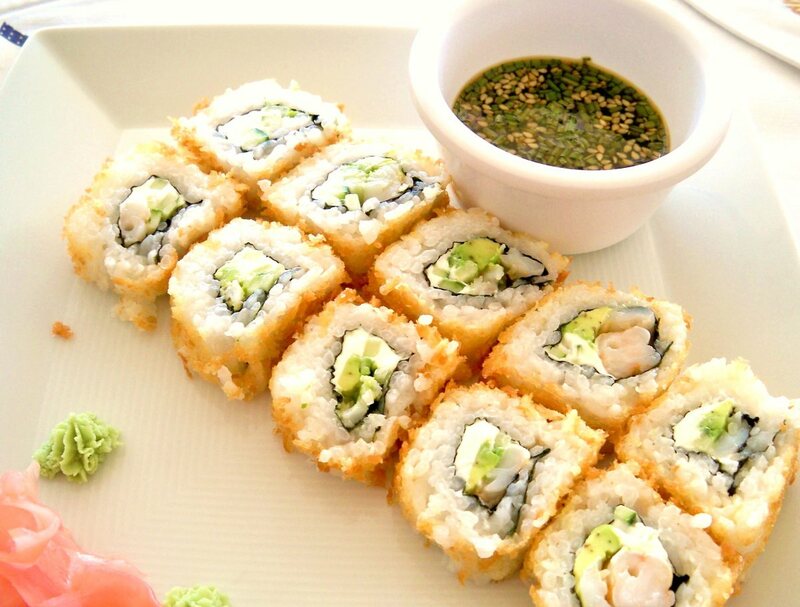 Place Tempura Shrimp Hand Rolls leaning against sushi.